The historic walled city of York is simply beautiful, and as such it boasts an array of stunning homes! Our experts utilise their passion for interior design and the extensive collection of shutters we stock to bring your dream interiors to life! Call the Just Shutters York experts on 01757 602459, or alternatively use the buttons below. Contact Just Shutters York on 01757 602459. The team are on hand to advise you on the options for shutters in your home, as well as book a home design visit. Firstly, shutters make for a stunning feature in any home! There are many different finishing options, such as; m aterials, styles, louvres sizes and colours. With our most extensive range in the UK, including exclusive Just Shutters lines, we are sure to find the right solution for you! Get inspired about the possibilities in your home by browsing our stunning galleries. Secondly, shutters are incredibly practical! This comes as a result of several unique features they posses. Features such as; being child safe, being easy to clean, requiring little upkeep and being very durable. 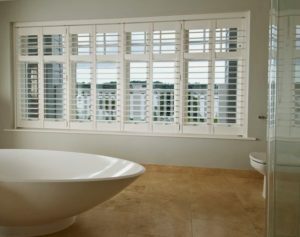 Overall, we are so confident in the practicality and longevity of our shutters that we offer a lifetime guarantee. Customer service excellence is at the centre of the Just Shutters ethos. Our staff strive to ensure that each customer is fully satisfied with both the quality of products and service you receive. Therefore, we are thrilled to have been awarded a 9.9/10 rating on Checkatrade!